Carry-all Caddy for all of your styling needs! Holds blow dryers, flat irons, curling irons, shears, brushes, combs and much more. 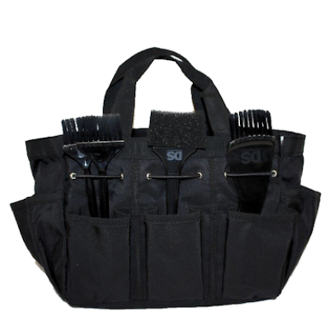 Conveniently stores all styling tools in one bag. Constructed from durable heavy duty fabric. The outer part of the tote features: 8 pouches and 6 elastic loops. Velcro closure to keep tools secure. Size: 10.5” W x 8.25”H x 5”D. Includes 4 DS Tint Brushes shown!